The Wednesday bento star was the char siew (BBQ pork tenderloin, Chinese style) tortilla wrap. The char siew was home made by my mummy based on inherited recipe from my grandma. I toasted the whole wheat tortilla, butter it, lay it with pieces of yummy char siew and carrot sticks. Added a half boiled egg with a little smiley face for kawaiiness. There’s slices of guava, pear and grapes. My princess ate all except for the extra carrot sticks and the guava and pear. 😦 Again, I wonder when she’ll ever eat healthier. 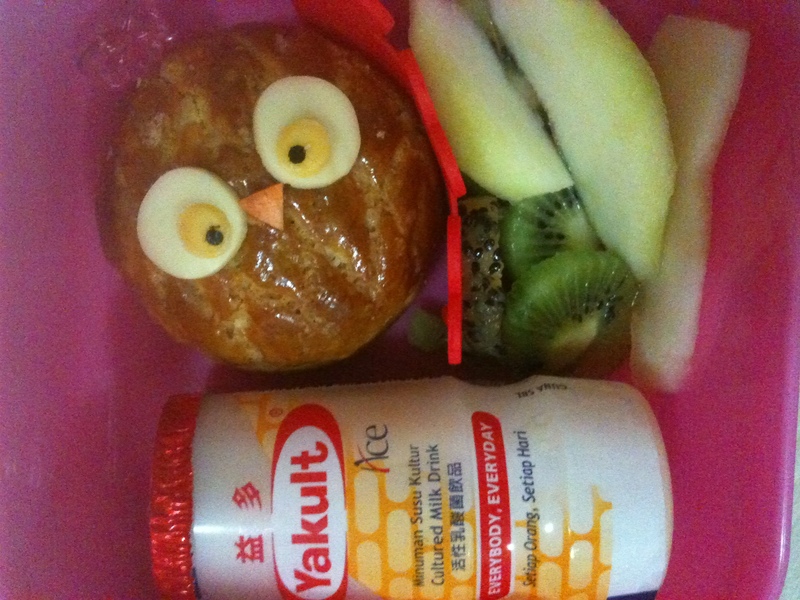 So for today, this mummy here hid some chopped up carrots into the birdy pancake for the bento. Made the pancake shape with the silicon shaper and it’s actually not that difficult. I just have to use slow fire and watch it closely. Birdy has got a kamaboko wing which I believe I cut the rounded edges wrongly but didn’t have time to make another one. 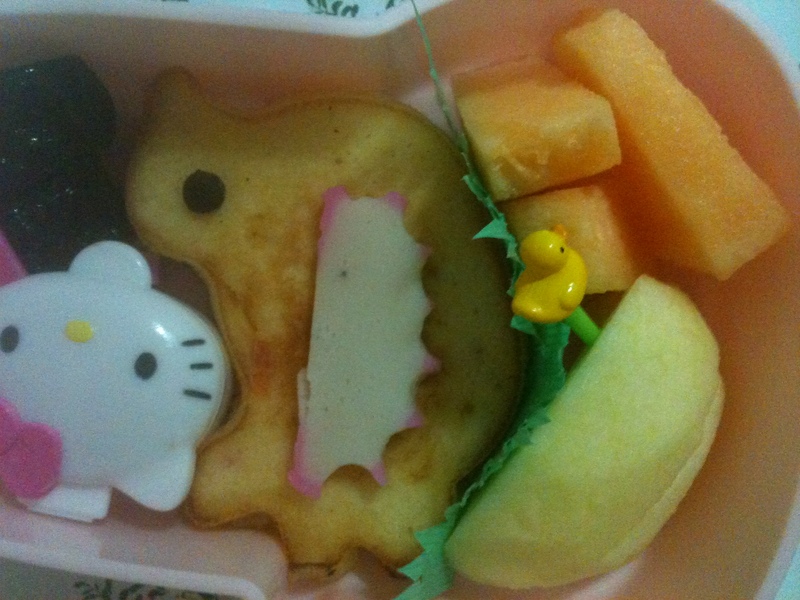 There’s also a little pink crown on birdy made with the cut out kamaboko but hidded under the HK continer. The eye is made from chocolate chip. The rest are some hami melon cubes and apple slices with two little prunes. 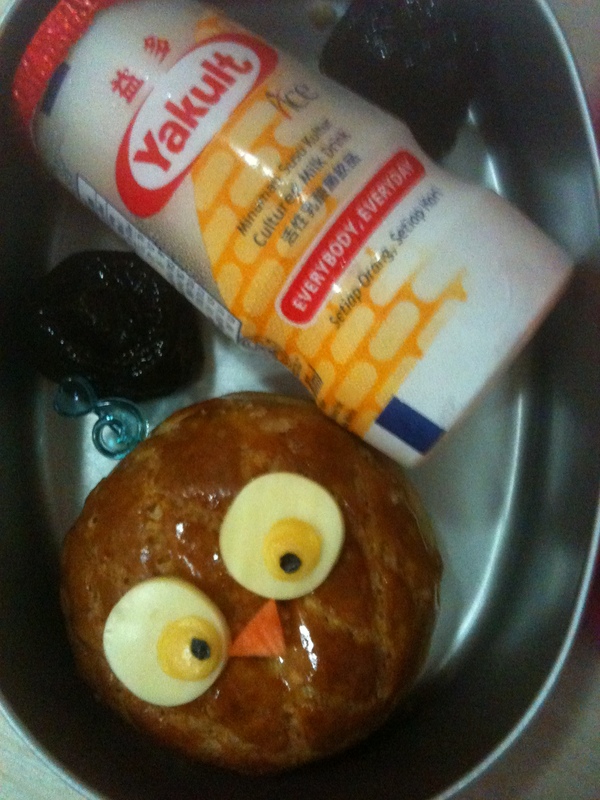 The pancake can be eaten with the honey in the HK container. This morning I overslept!! I always use my phone as my alarm but the battery died middle of the night. So there I was in dreamland until my “biological” alarm woke me up at 6am. Jumped up from bed and in my drowsy state, went to the kitchen stare at my freezer and pop two mini frozen chicken ham and cheese pie into the oven. 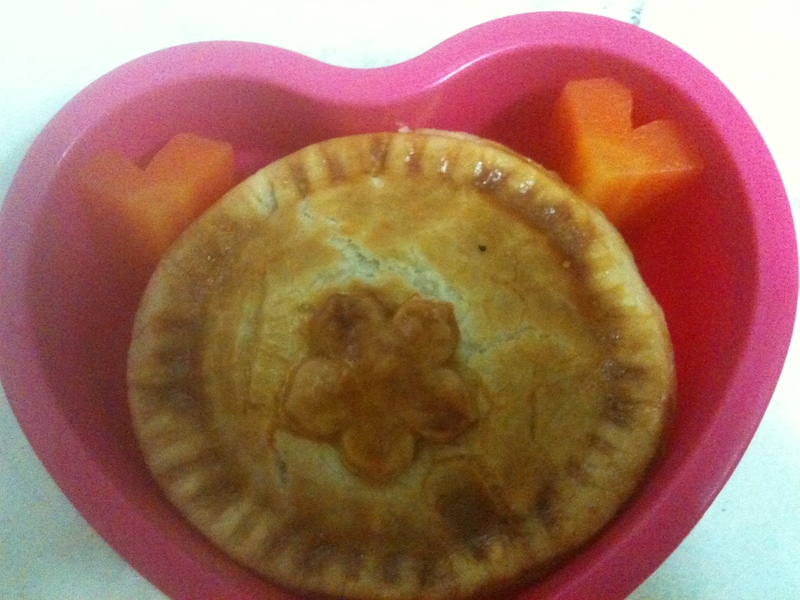 Went back in to brush my teeth, took a bath while thinking of the healthy sides to go with the pie. 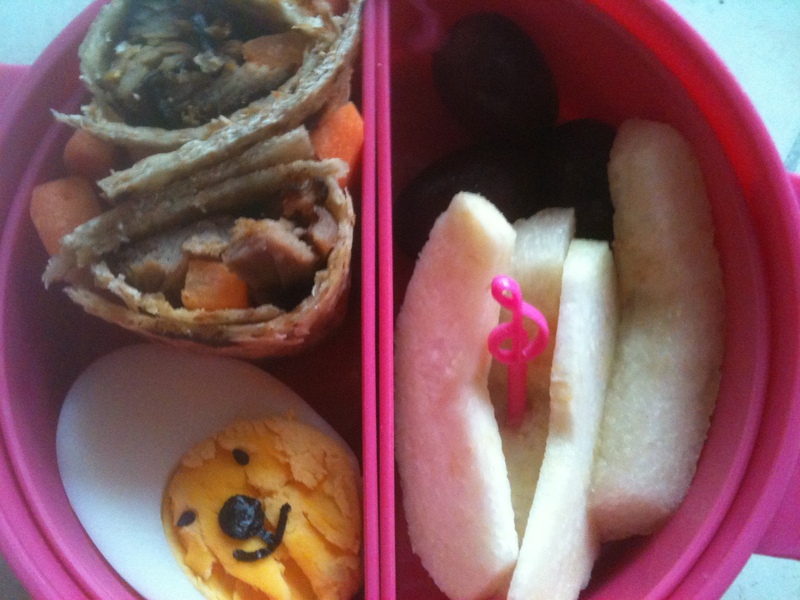 So tadaaa….here’s the simplest pop and boil and store bento for this morning. The best my sleepy head could worked out was to put carrot sticks for the fibre, vit and also colour to the dull looking pie. 😀 My little girl had some cut-up pears and apple in another side container but didn’t give any to my nephew as it’s still the “no fruit” diet. Made them into owlets and used my two new picks that I purchased during my recent trip to Daiso in Kota Kinabalu. Added a Yakult drink each (for a healthier tummy for my little girl who has a bit of constipation issue), kiwi and pear for my little girl and prunes again for my nephew. Wonder if they will finish these today? Oh and though I didn’t get my new toy, I got a better gift when I returned home. 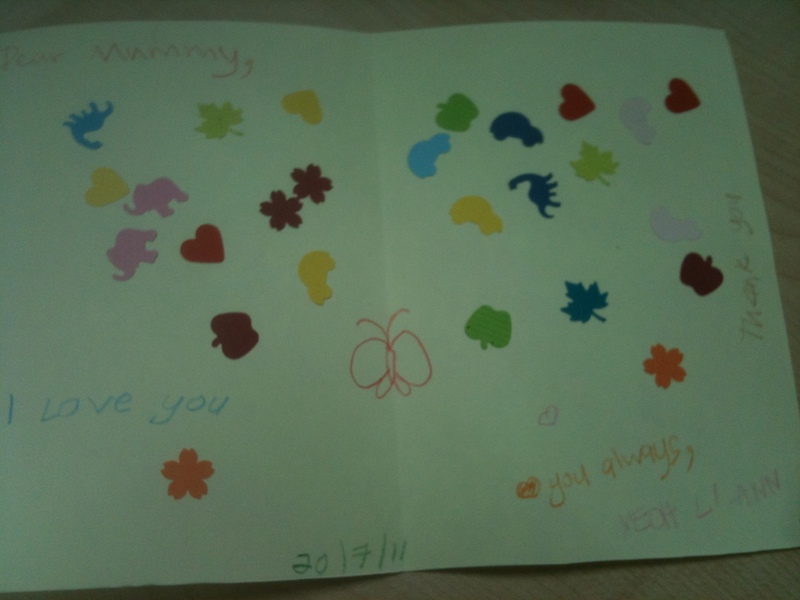 This beautiful card that my little girl made for me! As she gave me, she said “Mummy, its nice so you have to bring it to your office and show your boss, ok?” And I started laughing when she said that. 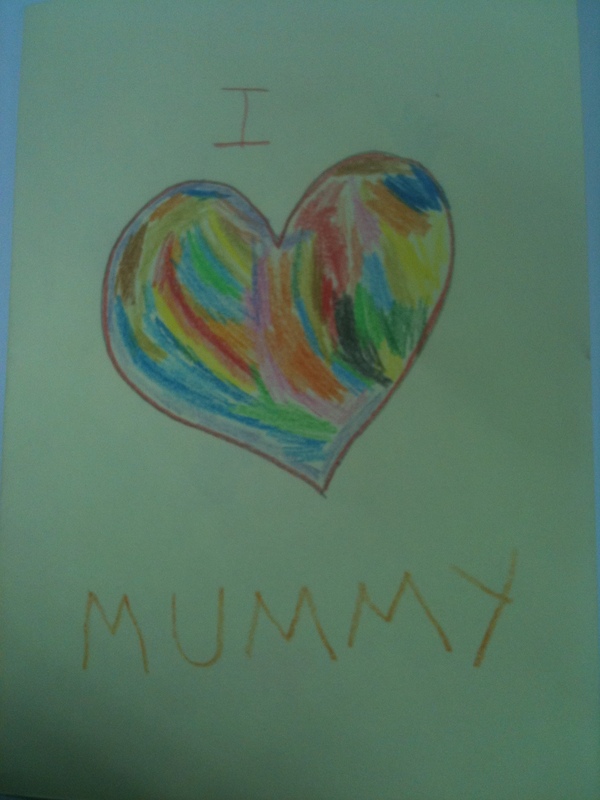 Little kids are so heart-warming….. 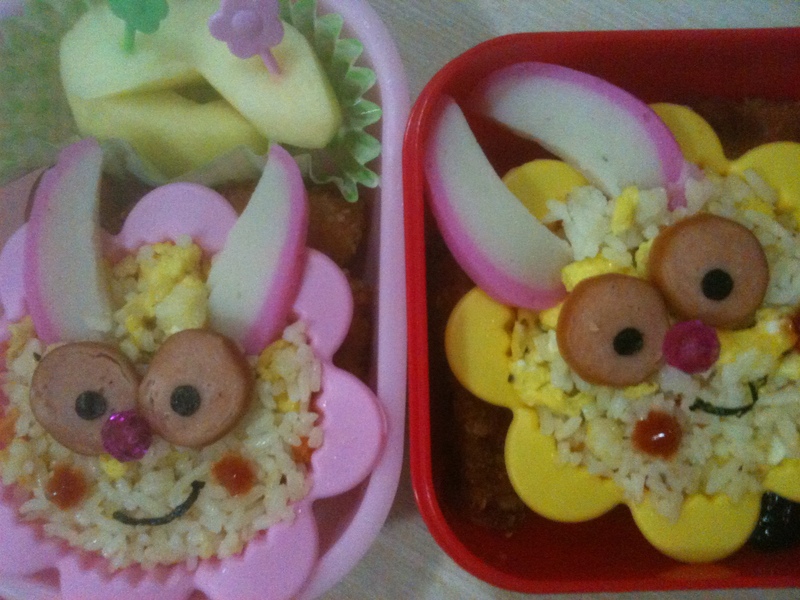 The rusty bento making mummy is back!! The tools had been collecting dust in the past months but now it shall make its debut again!! 😀 Actually, I did make some bento here and there but I just didn’t have the time to post any. Some of those that I made were fully inspired by akinoichigo! May post it some time later.